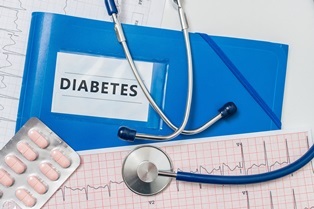 What Is Diabetes and Why Does it Keep You From Working? Diabetes is one of the leading causes of death and chronic disability in this country. More than 30 million people, or more than nine percent of the U.S. population, have diabetes, according to the American Diabetes Association. An additional 84.1 million people have pre-diabetes and are at an increased risk of developing diabetes. Many people believe that diabetes is a medical condition that affects only individuals who are overweight or those who eat a poor diet—this is not true. Diabetes is a serious disease that is linked to both genetic and lifestyle factors. In a person without diabetes, insulin in the blood carries sugars to cells throughout the body. These sugars are used to produce energy. A person with diabetes is unable to produce insulin naturally or cannot properly use the insulin the body produces, so the sugars stay in the blood, causing the high blood sugar levels that characterize diabetes. Nerve function may be lost. High blood sugar levels keep the blood vessels from dilating which leads to poor circulation. When there’s poor circulation, the nerves—especially those in the feet—don’t get enough blood and begin to lose function. As a result, a person with diabetes might not be able to feel foot injuries. Skin may become fragile. Poor circulation can cause the skin to become fragile. Wounds take longer to heal and are more susceptible to infection. In people with diabetes, even minor wounds can ulcerate and become serious. It is not uncommon for people with diabetes to lose limbs because of complications stemming from poor circulation. Major organs can be compromised. People with diabetes may suffer from heart, kidney, or eye damage. Any of these diabetes complications can interfere with your activities of daily living. The Social Security Administration’s blue book of adult disability impairments includes several insulin disorders as viable conditions for disability approval—depending on the severity of the condition and the effect on other body systems. Type 1 diabetes. Previously known as juvenile diabetes or insulin-dependent diabetes mellitus, type 1 diabetes results from the body’s inability to produce enough insulin to convert the amount of glucose in the blood. It generally begins in childhood and continues throughout adulthood. Type 2 diabetes. Previously known as adult-onset diabetes mellitus or non-insulin-dependent diabetes mellitus, type 2 diabetes occurs when the body’s cells fail to properly respond to the effects of insulin, impairing glucose absorption and metabolism. Diabetic ketoacidosis. An acute, potentially life-threatening complication of diabetes, where the body begins to burn fatty acids for energy in order to replace the lack of converted cellular energy which the deficient insulin could not produce. Unfortunately, acidic bodies known as ketones are released during the process of burning fatty acids, and if not controlled, can cause debilitating pain and death. Chronic hyperglycemia. Both types of diabetes can cause hyperglycemia, which is an abnormally high level of glucose in the blood that results from insulin being unable to filter it all out. The excess glucose may produce acute and long-term health complications. Chronic hypoglycemia. The opposite of hyperglycemia, hypoglycemia is an abnormally low level of blood glucose. Effects can vary, but severe hypoglycemia can lead to complications in the brain—brain tissue does not receive enough glucose to function properly—including seizures or loss of consciousness. Diabetes can often be managed. Thus, a diagnosis of diabetes is not enough to qualify you for Social Security disability benefits. Instead, you need to prove that you suffered a complication of diabetes, such as peripheral neuropathy, loss of kidney function, or something else that is both permanent and totally disabling. Do You Have Questions About Applying for Disability for a Diabetes-Related Diagnosis? New England disability lawyer John Keefe has written a book to help you with the Social Security disability application process. Request your free copy of 7 Costly Mistakes That Can Ruin Your Social Security Disability Claim, or contact Keefe Disability Law via this website or by phone to schedule a free consultation with a Social Security disability lawyer today.